You have just landed at the most beautiful spot on the Internet – if you were looking for the best budget 2.1 desktop speakers under $100. We have filtered out the best desktop speakers that should be one of your favorite budget 2.1 desktop speakers if you are looking for a price tag of under 100 bucks. But, what makes you choose 2.1 channel desktop speakers? Wouldn’t it make sense to get a 2.0 desktop speaker instead for less? Well, before taking a look at some of the best budget 2.1 desktop speakers under $100, we’ll inform you why 2.1 channel desktop speakers matter while making a pick for your setup. 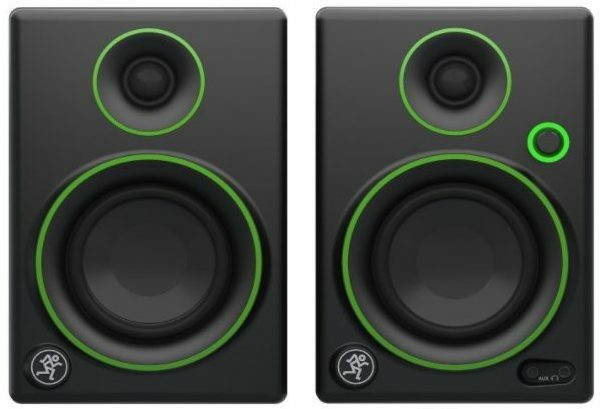 Quick Bytes – Why Opt For 2.1 Channel Desktop Speakers? There’s actually a simple reason to prefer the same. And, it is definitely no rocket science! 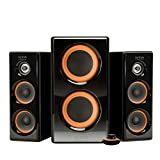 2.1 channel speakers define that there are two separate stereo speakers along with a subwoofer to deliver home theater like experience on a budget without necessarily needing a 5.1 channel speaker system. Of course, the 2.1 channel speaker system won’t suffice if you have a big studio room or workplace. You will need a 5.1 channel speaker system there. So, for the most of the personal computers, a 2.1 channel desktop speaker is enough to enjoy listening music. Logitech products are normally good enough, and they are well-known for their build quality. 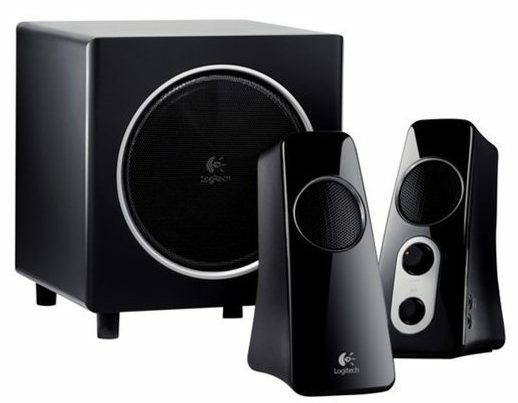 Here, the Logitech speaker system z523 is an attractive deal at just $74.50. The Logitech speaker system z523 is a potential speaker for a casual gamer or a person who works on experimental music production (small scale productions of course!). It is indeed a 2.1 channel speaker system and counts in as one of the best budget 2.1 desktop speakers under $100. It delivers a 360 degree sound experience. So, it is capable enough to be kept almost anywhere (excluding outdoors). You get an amazing level of bass with this speaker system as well as proper clarity while listening to dialogues. It is a bang for your buck! 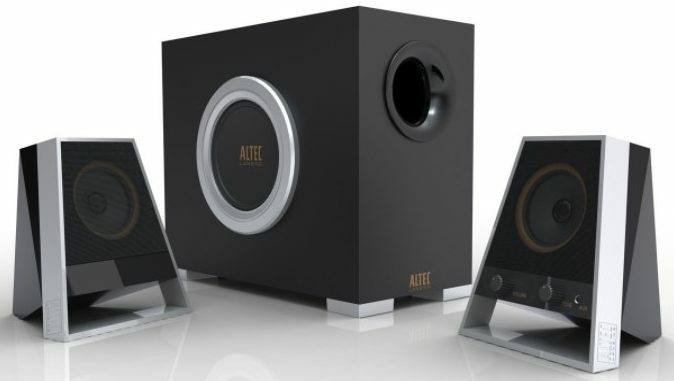 Altec Lansing VS2621 is one of the best budget 2.1 desktop speakers under $100. It is a cheap offering but delivers higher quality audio than one would expect with a 2.1 speaker system of just $59.97. The brand might not be a popular one, but the build quality of the speaker is good enough for the price you are going to pay. You get a minimal bass experience with this speaker system. Well, not too deep bass but it’s something manageable. The design language of this speaker system is impressive and would look good with any ongoing computer setup. What do you think of getting one of these? 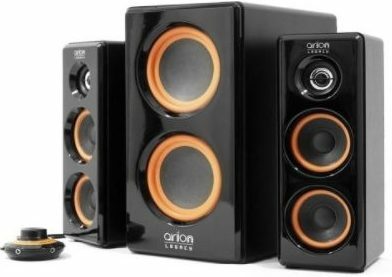 Arion Legacy speaker systems look very cool but cost considerably cheap. However, in this case, they’ve maintained the pricing plans of their products, landing this at just $79.95. The design offered at this price range could have been better, but it is decent enough. If you are someone who looks for a simple yet elegant design with a powerful audio output, this might be the one you were always looking for. It is unquestionably one of the best budget 2.1 desktop speakers under $100. But, do note the size of the speaker system in comparison to the desk you are planning to keep it on. It’s not a tiny speaker system but a wider one. Check this out. 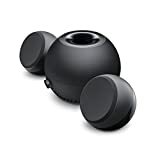 If you are on the lookout for a stylish set of speakers with an incredible audio output, then this could be one of the best budget 2.1 desktop speakers under $100. With the legacy AC, you get the best of both worlds. It delivers an impressive audio experience, and at the same time on a budget, you get a speaker that looks high-end! The theme goes with the color combination of orange and black, which looks cool enough. The speaker system delivers a very high-quality sound when compared to its pricier competitors at just $67.99. It also happens to be one of the best bookshelf speakers if you would want one. If it is so good, why not everyone gets this? Well, the size might be a problem here. It could perfectly fit on a bookshelf but not on every desk setup, nor would look great either with a big size. This is one of the best to have on your wishlist at least especially because of different color options available! Check out what color options you have with this desktop speaker system. Mackie CR Series is one of the most loved desktop speaker systems that falls just about in every category one could opt for. 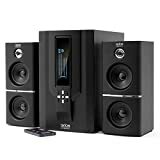 It is one of the best bookshelf speakers we’ve ever recommended, it is one of the budget studio additions as well, and the list goes on for specific purposes for under $200 budget. You get all the beauty and quality at just $99. You can opt for a used product as well if you want to save additional money. If you are not a person who like the used product, you may opt for the new one as well as per the availability from a variety of sellers available. It is an incredibly popular product, so the stocks end quite quickly. Check out this before stock ends. 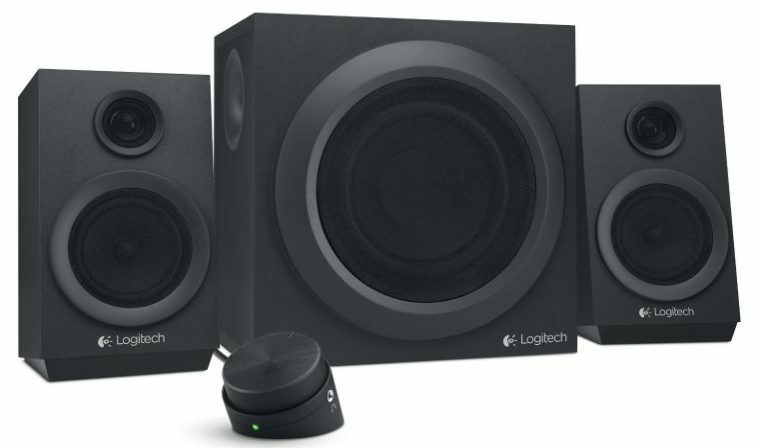 The Logitech z333 is an 80-watt speaker system which is one of the best bang for your buck. It is a quality product that you can grab for just $59.99. It is a compact 2.1 desktop speaker that is suitable for most of the users around. You should not underestimate the 80-watt system while it can deliver a pretty powerful audio experience as one would expect. Of course, you get the 3.5mm jack and also RCA inputs. You can connect it to pretty much anything. The Logitech z333 design is somewhat basic but not too bad. While not considering the design language, it surely delivers some serious audio output at the price range compared to some its competitors. The advantage here would be the front firing subwoofers. With that present, you will get an amazing audio experience on a budget. Click here to read more about this desktop speaker system. Dell V4J8D AE415 is an impressive addition under $100 as one of the best budget 2.1 desktop speakers. You may not find a competitor to this at the same price range. Maybe, you could find one regarding the audio quality. Do not judge a book by its cover! So, do not underestimate this by looking at its size either. It surely is a bang for the buck! But, when you look for a portable 2.1 desktop speaker, it should be a tough work to find an alternative. And, we do not think that you need to search for an alternative to this either. It is because you can get it for just $58.98. If you are looking for a compact pair of speakers, with good quality audio, and a reliable brand, then Dell’s V4J8D should be a perfect choice for under $100. 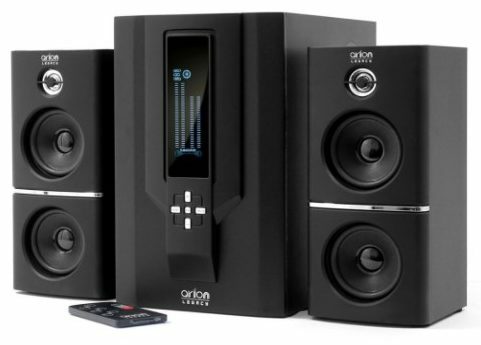 Arion offers a variety of speaker systems that are well-optimized for a studio or as a desktop speaker. It’s typically bulky compared to other desktop speakers in the same price range. But, it’s as powerful as some of its pricier offering available for more than $100 bucks with $150 at the most. 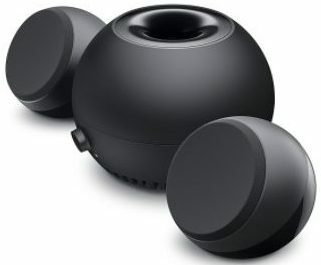 This might be a tough pick if you want a desktop speaker being bigger in size. But, that isn’t the end of the world, eh? Imagine a perfect desk setup with a big speaker? It should look very impressive! As an bonus, you get a remote system here with integrated LED light system. It is an impressive 2.1 desktop speaker at just $52.99 which also looks like a powerful music system! Want to grab this one? Buy it now from Amazon. Which is the Best Budget 2.1 Desktop Speaker under $100? So, here we have some of the best budget 2.1 desktop speakers under $100. You might miss many of the offerings under $50, but to get a good quality 2.1 speaker experience, we would advise you to have a minimum budget of $50. If you have a less budget than that, better get a Bluetooth speaker and pair it up with your computer system for use. What do you think about the budget 2.1 desktop speakers mentioned above? Let us know your thoughts in the comments below. I’ll definitely be checking out the Logitech speakers. I have a pair from a number of years ago and they still work like a charm. I’m a big fan of speakers, but my budget does not allow me to buy some expansive speakers. After reading now I have a list of good speakers thanks for this post. please suggest me some tower speaker i want to buy for my home use. These speaker can be used as a computer speaker ? which speaker for 5.1 output in 2.1 channel budget. quality accessories in low price. I have F&D 2.1 speakers and they work great. I don’t know if they are present on the international market.